No, I didn’t get a tattoo this week, although I’m kind of regretting not taking the opportunity. How many people get tattooed by a tattoo master on their own show? But here’s the truth: I’m really scared. I love the way tattoos look, and I had a baby ALMOST without an epidural, but I’m still kind of scared of pain. And I’m even more scared of the permanence. Full disclosure, I almost got a tattoo of the comedy and tragedy masks at 16. I just really think the realization that I almost permanently marked my body with something as cheesy as that, has made me second guess my own judgement. And what about all the people who permanently have tramp stamps?!? Anyway, on to our amazing three part feature this week! We got the opportunity to film at “Tattoo Rescue”, and “Inkmaster” tattoo artist, Christian Masot’s Downtown Jersey City shop, Roses and Rebels. This is a guy who’s been lauded as a tattoo master. Not one to miss out on a tattoo opportunity, I asked HudsonCounty60 Director, SanMartin Garcia if he wanted the opportunity. And boy, did he. The shop itself is cooooool. We’re talking exposed brick, open work stations, there are some of Christian’s awesome paintings on the walls, and Chi.Flo & Roses and Rebels merchandise hanging on a couple of clothing racks. Did I mention there’s something like a one year waitlist? Christian, himself, is a Hudson County native, which is really nice for me. I rarely meet someone from the area when we shoot, and it’s especially nice to reminisce with someone about the old days of Jersey City. He reminds me of kids I used to know, and it’s fun to talk to someone else about how things have really changed. After television success and opening a shop in Hawthorn, he returned to JC to open Roses and Rebels. The entire tattoo process itself was a mystery to me. I thought you walk into a tattoo shop and pick some preconceived design off a wall. Instead, Christian asked San to send over an image of what he was looking to get. It started simple— the yellow umbrella from one of his favorite films, “Harold and Maude”. He sent over the image from the Criterion Collection cover. When we arrive, Christian pulls up the image and uploads it to a super fancy iPad program and goes to work. He begins tracing, removing colors and resizing all while discussing the meaning with San. And I guess this is as important as the process— what does it mean to SanMartin? The film is about an elderly woman who meets a suicidal 20 year old at a funeral. They begin a romantic relationship, but it means more than that to San. She shows him how to live. So after talking and explaining the personal significance, Christian takes what starts as a tattoo of an umbrella, and ends up as a tattoo of the woman holding the umbrella and taking the disappearing hand of a young man. After deciding on a final design, Christian takes a picture of San’s arm and places the tattoo in the intended spot. I mean, how cool is that?? He then prints on to tracing paper and we move over to the tattoo station. Christian begins setting up. He pulls out brand new needles, paint, solutions, etc. Next thing I know, we’re off. San has setup the camera to film the process, his arm is on the rest and the tattooing has started. In about 45 minutes he’s done! I thought this was something that would take hours, but that’s it! And it’s wonderful! So beautifully done. SanMartin is incredibly happy with the results, and it’s abundantly clear why Christian is the master that he is. And here I am, wishing I had taken the opportunity to get the tattoo I’ve always wanted (minus the masks). For more information on Christian, you can follow him on Instagram here, as well as Roses and Rebels here. And lastly did you check out my super cool Chi.Flo shirt? You should check them out here. Now go forth and mark yourself. I had originally stumbled upon Jono Pandolfi's Instagram page a couple of years ago and loved his designs, but when I saw he was based in Union City, I was obsessed. I loved that something so beautiful was being made locally, and it wasn't in Hoboken or Jersey City, but in the town I live in. I went to one of their Seconds Sales (if you're unfamiliar, their Seconds Sales are when they sell overstocked pieces, and pieces with minor flaws for a discounted price), and was immediately taken with how impressive it was that this relatively small space in my neighborhood managed to produce so many gorgeous and on-trend pieces. Chances are if you've gone out to eat, you've eaten off of one of his plates. Jono has been a ceramicist for years and originally started his business in Long Island City. After an initial order from The Nomad Hotel, and then Eleven Madison Park, the business took off. 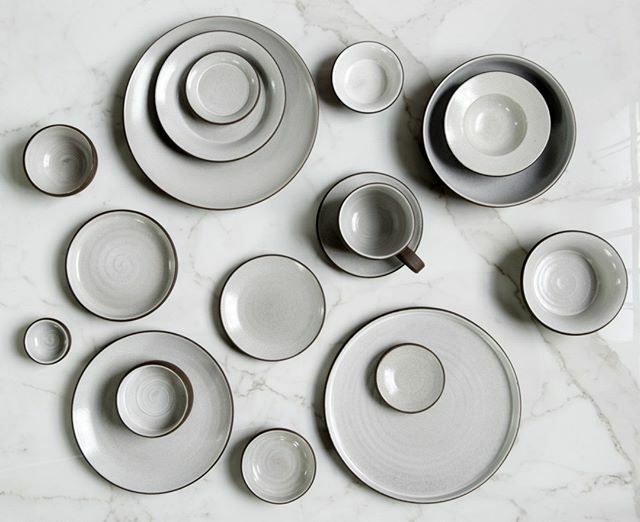 Pieces have been previously sold at Crate and Barrel, there's currently a line sold on Food52, and pieces are used at The Four Seasons Downtown NY, and local restaurant Corto. And not only is every piece gorgeous, but because they're made to be used in professional kitchens, they're also durable: they're dishwasher and microwave safe. In his space in the Yardley Building on Palisades Avenue, Jono has a team of five artisans and 3 hand jigger machines that shape each piece. The process has been streamlined: clay is processed through a pugging machine into long square slabs, then rolled through a slab to flatten and cut out circles that go into molds on the jigger. Once on the jigger, the clay spins and is flattened into the molds shape. The clay hardens a bit and then any excess is trimmed, and all excess clog is refused and run through the pug mill. Lastly, the piece is bisque fired, glazed and then cleaned off. All of this results in a handmade piece with unique details, but a uniform size and shape. If you're interested in buying pieces for yourself, that can be done on his website here, or you can visit Jono's Seconds Sale and Open Studio this Friday, August 24th at 600 Palisades Avenue, #105, Union City, NJ 07087.